The financial lessons learned from an unpredictable income helped one woman gain control of her finances and finally build an emergency fund. For most, having a predictable income and fixed expenses makes budgeting and saving a lot easier. Part-time hourly employees, contractors, and seasonal workers who jump from gig to gig or who work more in some months than others don’t always enjoy this same sense of stability — and working several different types of jobs with variable income structures can lead to hard lessons about managing money. I’ve done them all. I spent several years as a full-time, salaried journalist followed by three more in seasonal gigs: an active travel guide in the summer and an hourly office assistant and part-time swim instructor in the winter. I’ve been an independent contractor for a meal delivery service, a yoga teacher, and a freelance writer paid by the project. I recently returned to the world of full-time, salaried work. As a seasonal and hourly employee — and one who relied heavily on tips — I had an erratic income that made planning for the future difficult. There were perks to this type of employment. Housing between trips I guided was paid for, and I was virtually assured to have work the following year. There was flexibility to travel, move to a new city, work in a different industry in the off-season, and supplement with other sources of income. Seasonal work has a feast-or-famine quality. During my summer employment, I was flush with cash and thought I could afford to spend a lot. But in reality, I had to stretch those funds. Of course, not all seasonal employment comes with these benefits. If you’re picking up shifts in a retail store or taking a temporary customer service position during the busy holiday season, you likely don’t have expenses paid or the guarantee of a position long-term. And wages and working conditions vary widely across industries. Seasonal work also has a feast-or-famine quality. During my summer employment, I was flush with cash and thought I could afford to spend a lot. But in reality, I had to stretch those funds out over winter to supplement other short-term (and lower-paying) hourly jobs and cover rent and other living expenses while doing so. The challenge, regardless of take-home pay, was managing my money when my circumstances changed — from job to job and when switching from seasonal gigs back to a full-time position. Here are four things I learned along the way that changed the way I look at money. The hardest lesson I learned during my off-season and in my transition back to full-time work was that a cushy bank account doesn’t last long when overhead costs increase. Having a large balance at the end of every summer felt secure — even liberating — but that money disappeared pretty quickly when I had to put down a security deposit, buy groceries, and pay for gas, even when I had other sources of income. Instead of building an emergency fund and planning for those fixed expenses when I had the funds, I’d spent cash on things I shouldn’t — like a $500 leather jacket and a $250 bike computer. It’s important to think ahead and plan for the unexpected, especially if your income is variable. Most Americans aren’t prepared for emergencies, and I learned the hard way that if you have extra cash, you should put it to responsible use. When I had some medical expenses pop up that I couldn’t pay for outright (and didn’t want to put on a credit card), it prompted me to get serious about saving. 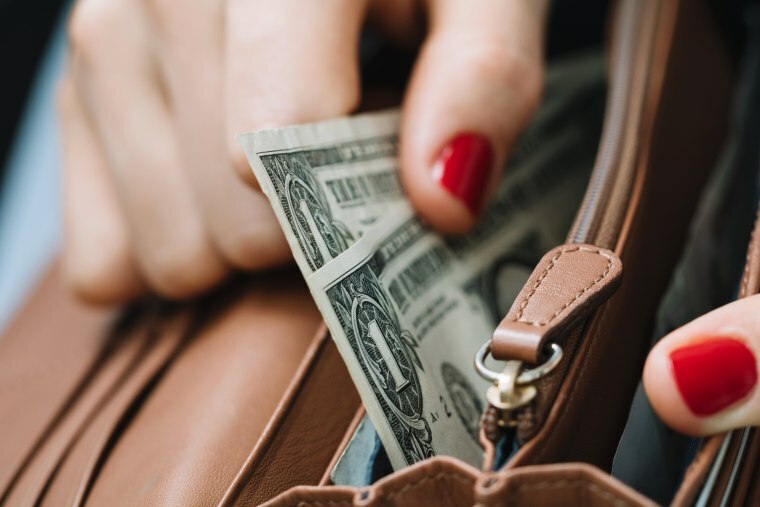 Financial planners love to hit hard on emergency funds, and it wasn’t until I had three months’ worth of expenses saved up that I felt confident in my financial security. I set aside $75 each week — which was manageable despite my fluctuating paycheck — and slowly built up this safety net. Money was tight at times, especially in the transitions between seasons and in waiting for a full-time paycheck to kick in. I was never at risk of not having food or shelter, but I did have to make some difficult lifestyle choices that I likely wouldn’t have encountered if I’d had a stable income or planned more carefully. I wasn’t able to attend weddings, travel to see family over the holidays, or purchase ski gear to take advantage of living in Utah over the winter. While I may have overspent early on in my seasonal employment, I did learn to live like I was making less — and still do. Using this rule while in a full-time, salaried position has helped me set aside thousands of dollars in savings to take those trips and buy that gear. Laura Gilman, a financial planner and managing partner at KCS Wealth Advisory in Los Angeles, California, explains that this mentality is like climbing a ladder. The first rung is building up emergency savings in case you get laid off, land in the hospital or have to repair your water heater. This is where you balance saving for retirement and other long-term goals with the “fun” stuff. “You can plan for fun,” Gilman says. Decide what else you want to spend your money on — vacations, home upgrades, a new computer — and how to prioritize what you’re saving toward those purchases. Earmarking savings for specific purposes and in separate accounts has helped me stay committed to my goals — which yes, includes some "fun" expenses. In our off-season, my partner and I paid a little bit more for a short-term, furnished apartment than we would for an unfurnished space with a year-long lease — but we saved a significant amount of money by not having to buy a bed, dining chairs and dishes that we’d eventually have to sell or store when we returned to our guiding jobs. Plus, we avoided any fees involved in breaking a longer contract with our landlord. Sometimes the cheapest option isn’t the best investment in your long-term financial well-being. Items that cost more but are of higher quality may last longer, which means you’ll spend less in replacement costs. Similarly, things that are more expensive on paper may add up to less money spent overall. For example, I’ve bought pricier kitchen appliances and cookware with the expectation that I wouldn’t have to replace them in a year or two— so the cost per use is actually minimal. But Gilman notes that choosing to spend more on some items is a personal preference that requires you to weigh costs versus benefits: "You always want to have a strategy if you’re stretching yourself a little bit more of how you’re going to get a payback down the road." My partner and I worked the same guiding job, had similar hourly wages in our off-season, and went back to full-time employment around the same time, so we were usually on the same page about how to cover our bills and manage discretionary spending. If we hadn’t talked about it, however, we may not have had such clear priorities and expectations. Whether your finances are always in flux or not, it’s important to talk about them with your partner or roommate or anyone with whom you share bills. Money conversations are difficult — but staying silent when you’re uncertain about what you can afford or struggling to meet your commitments can cause even more strain. These conversations will look differently for everyone, but Gilman recommends getting together at least once a month to go over shared expenses (which my partner and I do). How you approach financial discussions really depends on your relationship, she says, as each individual may have a different emotional attachment to money — what they earn and how they spend it. For example, some people prefer to split everything down the middle or have shared accounts; others may be more comfortable paying a percentage based on income and keeping “fun” money separate. Before you dive into your balance sheet, find out what works best for your roommate, spouse, partner or family member.